I spend so much time watching YouTube that, in 2009, I applied that knowledge toward creating a Showbits feature: Summer Shorts. Every weekday for a week, I posted a different short film to this site. In 2010, I revisited the format but over a longer period of time, sharing one video every Friday for 17 weeks. After a two-year hiatus, I'm pleased to announce Summer Shorts is back, though in a new context. Going with a thematic approach and a commercial outlet, I've compiled my nine favorite CGI shorts into a video gallery. "9 animated shorts that give Pixar a run for its money" is my first freelance feature for ITworld, an affiliate of Computerworld, the magazine where I was an editor for six years. Who needs Pixar? 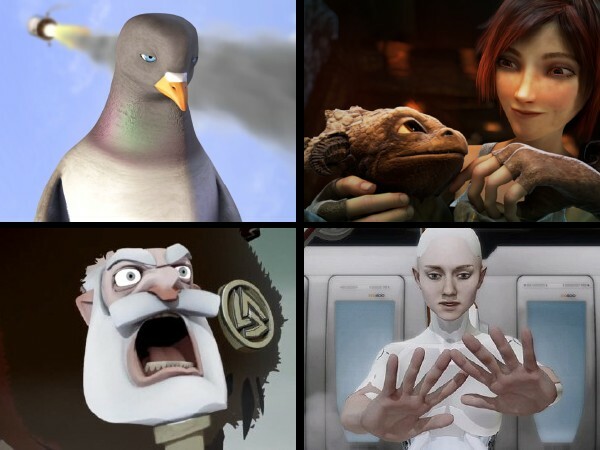 Here are my 9 favorite CGI shorts that you can watch for free right on YouTube. Two of the nine shorts will be familiar to long-time Showbits readers. Pigeon: Impossible and Kiwi, though older, stand as some of the most enjoyable and memorable animated films I have seen online. Five other shorts I'd seen before but had not previously shared, leaving Rosa and The Chase as new to me, the result of extensive research into YouTube's library. There were enough other candidates that ITworld's gallery could have been nearly double its length: six more videos, including The Passenger and Sebastian's Voodoo, nearly made the cut. As is, the final playlist totals an hour, making for an fun and diverse showcase of the fastest, funniest, most poignant CGI films YouTube has to offer. Today brings to a close this year's Showbits Summer Shorts. Over seventeen weeks, we have brought you a variety of remarkable independent films — from fact to fiction, tragedy to comedy, animated to live action. Through it all, I've been saving the best for last. It was just about a year ago as I was exiting the Boston Convention Center with the curator of the Apple II History site when we realized we'd not gotten our parking validated. As we trekked back into the building, Steve was reminded of an Internet film he'd seen some time ago. After we parted ways, I went home to find it for myself and was immediately taken with its cleverness, sincerity, and uplifting message. Labor Day Weekend often marks the end of summer, but before that milestone, I want you to see one last summer short: Validation. This film starts with a simple and superficial play on the word "validation", and it could've ended there, too, as a short and funny but not very motivated comedy. Instead, the film follows an arc that has proven successful for such storied tales as Star Wars: an initial victory, a crushing defeat, and finally, a surprising and resilient triumph. And without having a large cast of central characters or much time in which to tell its tale, Validation manages to throw some curveballs that I never saw coming. Like director Kurt Kuenne's other film, Rent-a-Person (which makes sense of one of Validation's scenes), this story is about finding professional and romantic success no matter what comes your way. We see this evidenced not only by our parking attendant, but also Victoria's mother, who we discover plays a pivotal role and one that makes the short incredibly empathetic. As the son of someone with multiple sclerosis, I know too many people whose conditions aren't getting better and may never. Yet they nonetheless keep a positive attitude. I don't know how they do it, but I know the value of doing so. Seeing second-hand impact Vicki's mother has on her family is evidence of that. I'm a sucker for happy endings, and Validation fulfills that need, but not before telling a poignant yet enjoyable story. Even when you've lost everything you have and can't have what you want, you never know what will happen next. As Tom Hanks said in Cast Away: "I gotta keep breathing. Because tomorrow the sun will rise. Who knows what the tide could bring?" Given that some of my favorite films are Office Space and Stranger than Fiction, it's no wonder I like this short: it's almost as if either of those were adapted to a musical. Despite that, there's not much to dissect here — Rent-a-Person is a silly, fun tale about how even nice guys don't have to sleep alone. There's some attempt at character evolution as our hero thinks he can substitute money for women (or use one to get another) before realizing his life is as empty as before. But even if that arc proves futile, it's encouraging to see him recognize his life's potential and find the motivation to actually do something about it. Too many people are satisfied with the mundane and subpar without taking advantage of their natural talents to realize the good fortune that could be theirs. Coming next week: the exciting conclusion! I enjoyed Flower Warfare not for the plot or the acting, both of which are paper-thin, but for the visuals and the exuberance. Being shot with flowers is apparently no less fatal (or surprising) in this short than in real life, but the bright colors and renewal of life make it seem so much less regrettable. That's not to say violence should be trivialized — but there's a big difference between how it's portrayed in Space Invaders and Mortal Kombat, for example, or The Man Who Shot Liberty Valance and Saw. A similar short uses armaments made of cardboard, but the militaristic approach to the short makes it far less fun. By contrast, the Flower Warfare actors are obviously enjoying themselves and don't get caught up in the dark, brooding, fatalistic nature usually involved in such territorial encounters. The closing double rainbow, though gratuitous, underscores this light-hearted atmosphere. Spoofing Star Wars never seems to go out of style. From RiffTrax to Robot Chicken to Family Guy, many artists have used this theme for more than just an independent one-off, making it a continuing commercial venture. But few have the history or duration of Pink Five, which debuted as far back as 2002 with sequels appearing in 2004 and 2006. This independent fan series presents an alternative perspective on the events of the original Star Wars trilogy (episodes IV–VI). Paralleling the well-known tale of a rebellious young moisture farmer, the audience instead follows a dim-witted but obstinate Valley girl. It may sound annoying as all heck, but stick with it, as the writing is actually quite clever — her landing on Dagobah will have you laughing out loud. The character even proved popular enough to have a cameo in the official Star Wars expanded universe. The shorts' special effects are also inspired, their many subtle touches effectively inserting our heroine into George Lucas' universe. The official versions of all four shorts don't load as quickly as your typical YouTube video so are included after the break. I was struck by this film at first, as it puts on the surface the "different" that we all feel inside. Being pretty is hard. Being in college is hard. Hell, being alive is hard. Many of us suffer in silence, but this story's protagonist can't hide what makes her different. Whether she's doing it as a courtesy to her friends (if any), or to protect herself, the concept of living life with a bag on one's head is both funny and sad. The first few scenes made me wonder how the actress would convey emotion. On Star Trek: The Next Generation, LeVar Burton couldn't use his expressive eyes yet still managed the full range of sentiments. When Paper or Plastic's protagonist started magically changing bags when a real-life scenario would've afforded her no such opportunity, I felt a bit cheated. The ending was also a letdown. Perhaps it would've been too cliché for the boy to have wooed her out from under her shell, revealing her to be the beautiful young woman she is. And though true love persists "in good times and in bad", I believe it should not simply prompt equilibrium within the couple, but also inspire each person to be his or her best. Is that the metaphor the title is suggesting? I did enjoy the short's soundtrack — but the credits include none for the music, leaving me unsure where to find more of it. Maybe I'm reading too much into this film, and it's supposed to be just a cute love story. What do you think? This cartoon's theme of turning one's loved one into a weapon is reminiscent of "Family Dog", the animated episode of the Steven Spielberg anthology series Amazing Stories, in which the family's efforts to turn their pet into a security system met with equally disastrous results. Won't dog owners, Elmer Fudd, and their ilk ever learn that sacrificing what's good in life to hurt another only ends up hurting oneself? But then, if they ever did learn that lesson, we bystanders would be poorer their wonderfully screwball antics. So maybe things are fine just the way they are. Just as There She Is!! was a demonstration of Korean art, Kungfu Bunny 3 is Chinese in origin, though both films defy what foreigners might expect from that region's style. It's good to mix things up now and then and be reminded that not everything is anime.